Golden State routs the Indiana Pacers as Stephen Curry scores 23 points in the first half. 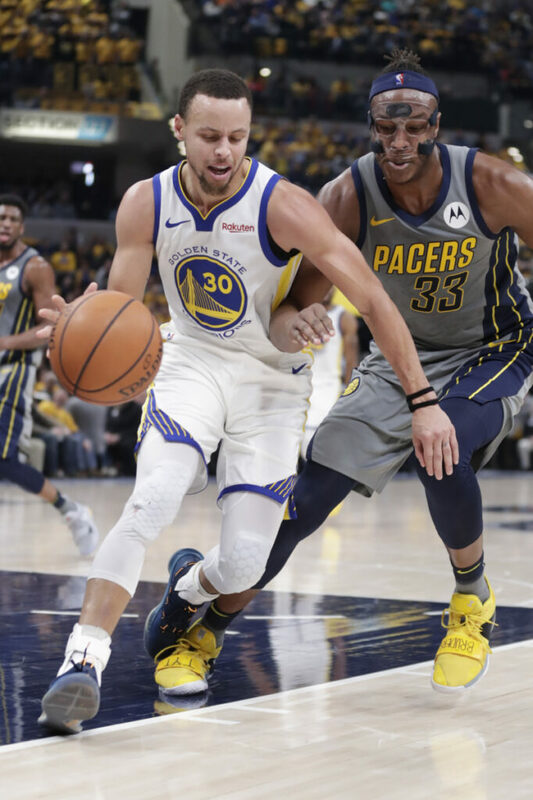 INDIANAPOLIS — Stephen Curry scored 23 of his 26 points in the first half, DeMarcus Cousins added 22 and the Golden State Warriors extended the league’s longest winning streak this season to 11 with a 132-100 rout of the Indiana Pacers on Monday night. HORNETS 101, KNICKS 92: Kemba Walker and Tony Parker each had 15 points, Malik Monk had four clutch 3-pointers in the fourth quarter and Charlotte handed New York its 10th straight loss, in Charlotte, North Carolina. He knocked down back-to-back 3-pointers, one coming on a nifty play from Walker, who delivered a wraparound pass from underneath the basket to an open Monk at the top of the key. That started the 17-1 run with Monk accounting for 12 points and Walker five. Walker was just 5 of 16 from the field, but made a big step-back 3 from the corner and Monk followed with another 3 to give Charlotte its largest lead at 87-75 with 7 minutes left. The Knicks never mounted a serious challenge after that. NUGGETS 95, GRIZZLIES 92: Nikola Jokic scored 24 points and made a go-ahead basket with 28.9 seconds left, and Denver overcame a 25-point second-half deficit to win in Memphis, Tennessee.